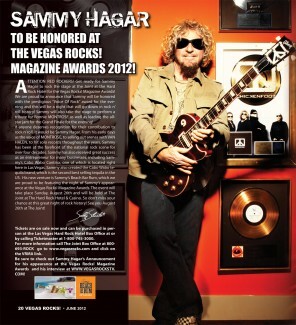 Awards Show featuring honorees Sammy Hagar, David Coverdale, Michael Schenker, Geoff Tate (Queensryche) and more!. 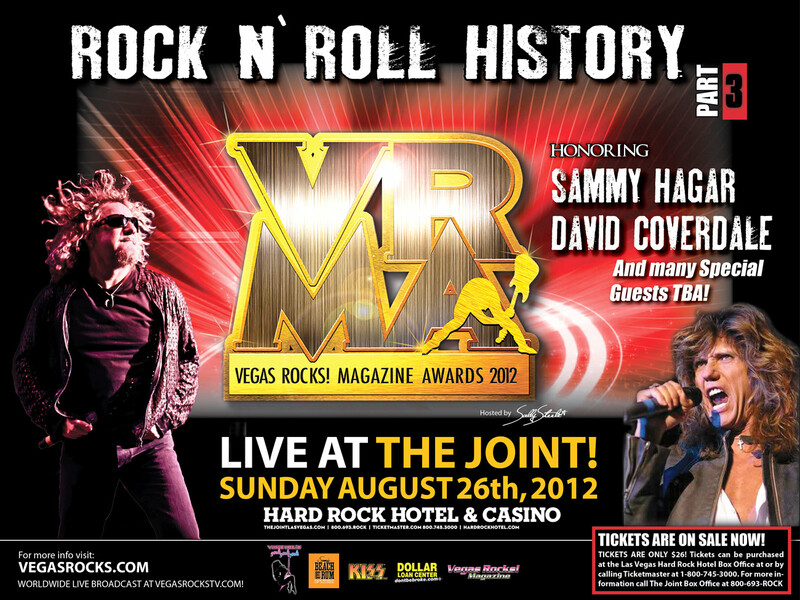 SAMMY TO RECEIVE THE "VOICE OF ROCK" AWARD AUG 26TH AT THE 3RD ANNUAL VEGAS ROCKS! MAGAZINE AWARDS! SPECIAL PACKAGE DISCOUNT - Come early to join Sammy at "Sammy's Beach Bar Rum Bash" the night before at Club Vinyl Saturday AUGUST 25th and get tickets for BOTH shows for just $40 (see below for details)! 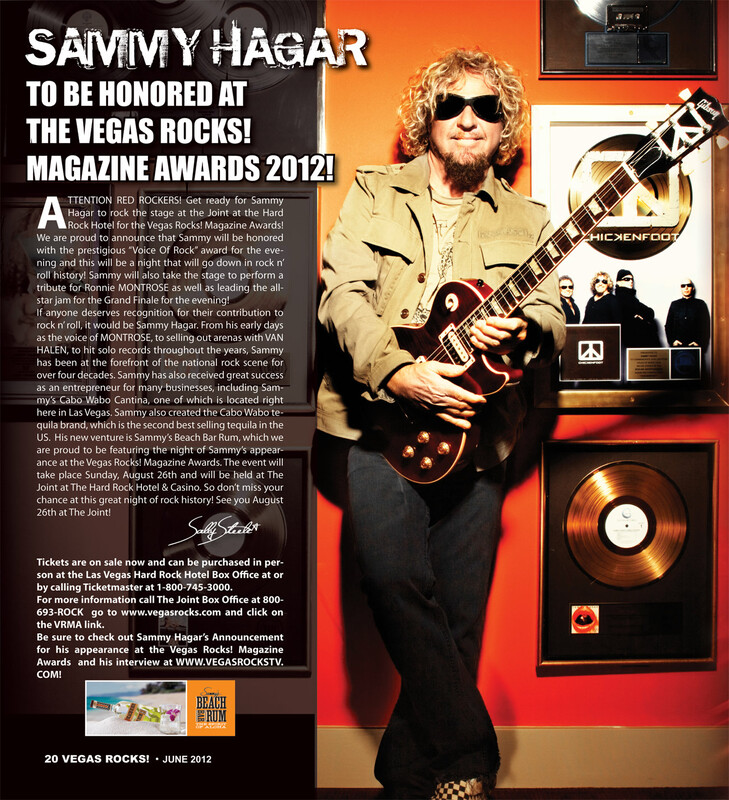 Sammy will receive the VOICE OF ROCK award at a star-studded gala celebration of the 3rd Annual VEGAS ROCKS! Magazine Awards show at the Joint at the Las Vegas Hard Rock Hotel. This show will truly be a night to remember for rock 'n roll! You also won't want to miss other honorees DAVID COVERDALE, MICHAEL SCHENKER, and GEOFF TATE (Queensryche), plus the Grand Rock 'n Roll Royal Red Carpet media event with some of the most famous rock artists in the music industry, and very special guest performances! Make it a Vegas weekend and come early for "Sammy's Beach Bar Rum Bash, hosted by Sammy Hagar" featuring music by surf band The Hula Girls, exclusive raffle door prizes, and of course plenty of Beach Bar Rum! We had so much fun at the first Rum Bash in April in the Bay Area that now we're taking the party to Vegas! We're once again going to the beach - a la Frankie Avalon and Annette Funicello on steroids! Beach dress code is a must and the Red Rocker himself will be serving cocktails behind the bar and twisting & shouting with the folks! If you only want tickets to the VEGAS ROCKS! Award show, they are on sale now and you may purchase by visiting Ticketmaster. If you want to by a package ticket, or just a ticket to the Rum Bash, those tickets are limited and will be available on a first-come, first-serve basis starting at 10 AM PDT on FRIDAY JULY 6th. To make your ticket request for either of these two options, email SALES@REDROCKER.COM and specify which ticket option you would like. Requests received before 10am will be ignored. This includes tickets to both the Club Vinyl Rum Bash on the 25th and also the VEGAS ROCKS! Magazine Awards event on the 26th. This is only a ticket to the rum bash on the 25th. Package and Rum Bash tickets are limited to 2 per order and will be will-call at the venue. We will contact you within 48 hours via email if you have secured tickets with instructions on making your payment. what an amazing weekend, so glad i was a part of it. Preparty at hardrock? At pool? How do i get a wristband. Got tix to VRA...not rum bash. Would at least like to go to a preparty. Tropicanas just not rockin like the Hard Rock, im sure! Count me in for the Cantina...let me know what time on Fri - I get in around 11 and I will be at the HR pool by noon...call or text me and I will do the same when I get in...Keep me posted...Vegas Rocks weekend here we come - count down begins 3-2-1- Lets ROCK - come on Friday baby!!! This is gonna be a blast - How many Redheads are ready...I know this one is....come on Vegas!!! Sounds like the HR pool party on Sat.YooHoo..its gonna be RED!!! What are you guys doing Friday night??? Lets get this party started early!! So ready for this event. It will be a pre-show before the October trip to CABO!!!! Sammy Hagar, Geoff Tate, David Coverdale, Michael Schenker all on stage...this is going to be amazing!